Home/News/The Chair of the National Safeguarding Panel @churchofengland attempting to sell a counterfeit suggestion that mandatory reporting exists within the Church. Here is the interview with Ed Stourton. In the first minute, Ms Munn provided clear opinion on what should now happen with this matter. Ed Stourton then read an extract from a letter sent to Andrew Graystone by the Bishop of Chester. Below we provide the transcript of the interview with Ms Munn from @1’39” onwards. Our observations are interpolated into the copy under ‘comment’. Emboldening and italicisation are ours. Meg Munn : (@ 1.39 0n the recording) …. the Church has to stop thinking that it can deal with these things (suspected and known abuse of children) internally. By his own admission, he’s (the Bishop of Chester) not an expert he ‘should’ have been reporting this to somebody else to investigate. That’s the point. They …… you mustn’t keep these things internally. Let the people who have got the experience and expertise, the police and social services etc, actually look into these issues you know ministers within the church, priests, vicars whoever – they are not competent to make those sort of decisions, and as soon as they have a concern they have to refer on. Comment : We largely agree with the thrust of Ms Munn’s reply but already questions begin to arise. The first italicisation is correct – the Bishop of Chester ‘should’ have reported (to police in this case), but all such referrals by those working in Regulated Activities (including faith settings) are discretionary in England, Wales and Scotland because we live in jurisdictions that, with the exception of Northern Ireland, do not have mandatory reporting of known or suspected abuse by designated mandated reporters. So when she says “you mustn’t keep these things internally” she’s morally correct but legally incorrect. Stourton: That does raise the question of mandatory reporting, whether it should be automatic that these things, which is something that you have reservations about? Munn: Not at all. I absolutely think there must be mandatory reporting. And my understanding, within the church is that they have to report. Where we get a confusion is that there is errr, some people who believe it should be a criminal offence. I am yet to be convinced, I am not saying, you know, I haven’t got a closed mind to having that discussion but I am yet to be convinced that making that something a criminal offence would be problematic. But in terms of ……. Comment: Note the formulation ‘my understanding within the Church is that they have to report……‘. Ms Munn’s understanding isn’t even correct in terms of the Church of England’s own published safeguarding procedures. Mandate Now analysed the CofE procedures and this was delivered to IICSA through Richard Scorer of Slater Gordon who represented so many Core Participant abusees in the Anglican investigation. Ms Munn claims to support mandatory reporting but then spends the next four minutes telling us why she doesn’t want mandatory reporting actually to be mandatory. We request Ms Munn examines the CofE policy and states what mandatory reporting obligations exist in the Church and the sanctions for those who do not fulfil these obligations. The site below is reserved for this evidence. Ms Munn’s evidenced explanation of the legal framework that delivers alleged Mandatory Reporting in the Church of England. Following Ms Munn’s tempered claim that MR exists in the church, we hope she will provide answers to the following questions: (i) MR applies to whom in CofE? (ii) A referral ‘must’ be made to whom? (iii) A referral must be made in what circumstances? (iv) What legal protection is provided to the MR reporter by CofE protocols? (v) What is the sanction on Mandated Reporters for failing to report? (vi) Please provide examples of administered sanctions and year. Stourton: Why, why, sorry, just picking up, ….why do you think that would be problematic? Munn: Because I think we need people to report, we need people to seek guidance, I think the likelihood, if it were a criminal offence is that we’d hear even less errr.. that we do now. Comment : Ms Munn is taking the somewhat counter-intuitive approach that not making something a law is the most effective way of encouraging people to do it more than they do now. By her logic we should encourage people to drive more safely by consigning the offence of dangerous driving to the bin. Clearly Ms Munn is expressing a personal opinion not grounded on empirical research from MR jurisdictions which demonstrate the opposite. 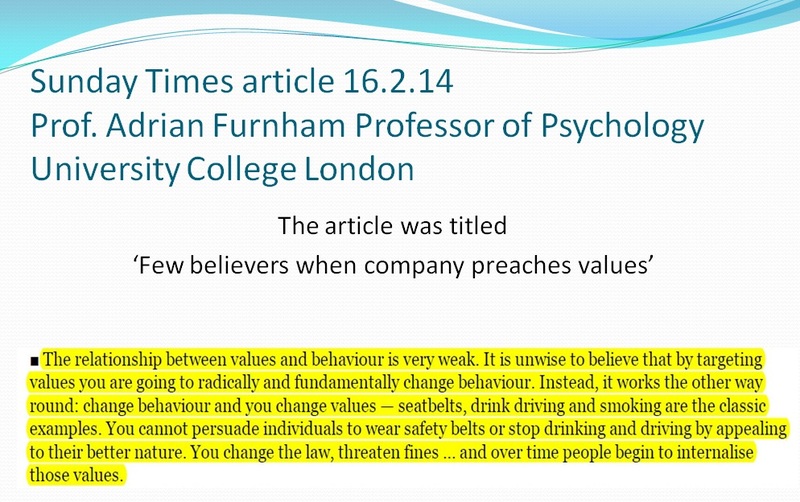 Ms Munn favours a CofE self-regulated mandatory reporting system i.e. the status quo with a counterfeit label applied to the safeguarding policy that says : “Mandatory Reporting”. It’s nothing more than ‘pretend MR’ which the Department for Education favours for reasons that have nothing to do with safeguarding. No one who is serious about making a step change in safeguarding within Regulated Activities, can get close to it by omitting well designed mandatory reporting legislation. Munn: Yes, I do. I think, I think people within the Church are frightened because they err.., don’t know what they need to do and they would probably just …err, say that they hadn’t heard something. But as I say ……. Comment: Ms Munn’s answer is unevidenced personal opinion. If ‘people in the Church’ wouldn’t know what to do under a mandatory reporting law, then they have absolutely no hope of knowing what to do with the chaotic House of Bishops safeguarding policy which we reviewed here. This is a breathtaking claim by Ms Munn. ‘People in the Church’ must live in a state of permanent fear. They must know that each of them is open to innumerable criminal offences by just driving to the supermarket to do the weekend shopping. There appears to be a desperate clutching at straws to dismiss that which Ms Munn claims she supports. Stourton : But don’t you think they’d be frightened of committing…. I mean most people are frightened of committing …. most sort of respectable people are frightened of committing a criminal offence, it might just tip the balance it people’s minds mightn’t it? Munn: It might but I think these needs to be tested. For me there has to be strong mandatory reporting requirements linked to their roles within the Church of England. Absolutely people ‘should’ report that has to be the ‘message’ and not to do so is a serious matter. And err……. Comment: Mandatory reporting has to be tested? Why, because it’s all so new? Ms Munn is not a barrister. Making a ‘professional expectation’ into a functioning mandatory reporting obligation absent of legislation is impossible. We have not found any existing example. But the question this proposal begs is why would one not want to extend law to protect children in the care of adults other than their parents? At IICSA on 13/3/18 during the Anglican hearing, Revd Canon and Worshipful Dr Rupert Bursell QC – former Chancellor of Diocese of Durham talked about the confessional and his support for the introduction of #MR for child abuse while using a number of precedents we’ve often cited from the start of our efforts to see law introduced. Stourton: With sanctions attached, you know – if you are a Bishop and you don’t report you get fired or something of that kind. Comment : Bishops’ priorities have tended to revolve around protection of reputation. The absence of mandatory reporting via statutory legislation will see that continue. There is no compulsory reporting in the Church – it is nothing more than a discretionary expectation despite the hyperbole in this interview. But we have provided the space above for Ms Munn to evidence the claim that she “understands” exists. Stourton: Well I suppose that does, forgive me, that does lead back to the question of why if you, if you accept that would have an impact when it’s a matter of church discipline why don’t you accept that if it was a matter of law it would have a similar impact. Munn: I think that it takes to a different level, I think you are talking about different levels of proof, and I think that becomes problematic, in terms of then ….the Bishop here has now said this is what I did, if this was a criminal matter would he have said that? I don’t know. Stourton: And you think it might have the opposite effect to the one that was intended. Munn: It might. As I say I really don’t (exhale)…these issues will, are being looked at by the Independent Inquiry into Child Sexual Abuse, I want to focus on the fact that the church needs to change. It’s first instinct must be not to accept stories such as the one the Bishop of Chester had and to think that everything is fine, their first instinct always has to be the protection of vulnerable people of children. And not to respond in that way to me is incomprehensible. Comment : Mandatory reporting might protect fewer children is Ms Munn’s suggestion – and the evidence supporting this opinion is where? Nowhere is the answer. Then Ms Munn moves onto the old crowd pleaser ‘change.’ Often raised by among others Sir Roger Singleton when he last spoke at Synod for example. But he like Meg Munn, fails to provide any credible proposal for its delivery. Sir Roger, who is also on the National Safeguarding Panel, dodged the Mandatory Reporting question put to him by counsel at IICSA during the Anglican Hearing. Sir Roger has had thirty years to think about it but despite this, still hasn’t reached a conclusion on this ‘challenging'(?) question despite the body of data replete evidence that indicates it is a vital component of functioning safeguarding in Regulated Activities. Stourton: Meg Munn that you very much indeed for joining us. To demonstrate we are not anti-CofE or anti-faith, here is Danny Sullivan in 2013 saying the Catholic Church already has mandatory reporting. But it hadn’t and hasn’t. And altogether more recently, here is Christopher Pearson the Chair of the National Catholic Safeguarding Commission on bbcR4 ‘Sunday’ on 10/3/19 claiming the Catholic Church has Mandatory Reporting. It’s nonsense. It doesn’t and it cannot without law which does not exist, and yet the BBC interviewer said nothing. Another free pass for someone in charge of a safety critical function in an institutional setting. How might it have happened that the two largest Churches in the UK are both mistakenly claiming they have Mandatory Reporting? Is it indeed a mistake, or is it a coordinated tactic to try and ensure legislated mandatory reporting is never introduced? 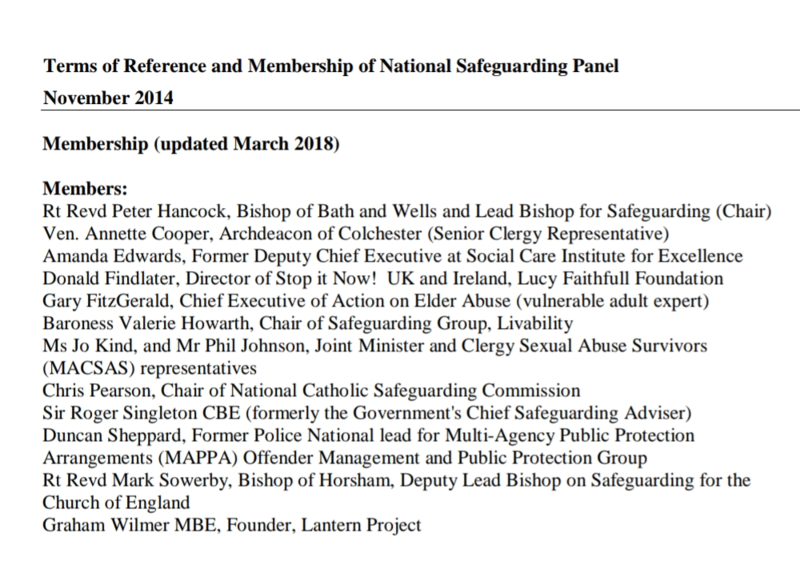 Please see dated list of members of the CofE National Safeguarding Panel. As you can see Christopher Pearson was on the board in 2014 and today, while he no longer seems to be a member we understand a representative from the Catholic Church still is. Unfortunately a full and current list of members of the National Safeguarding Panel cannot be found on the Church of England website. It’s an odd coincidence that these two Churches are both promoting the same fantasy about reporting child abuse.